In case you missed us or weren’t able to attend, Rather Dashing Games rocked the house at Origins 2016, last week. We showed off our latest game, We Come in Peace, which will be available at Gen Con in August. Both Mike and Grant made appearances on Board Game Geek and The Dice Tower. We’ll post links to those videos as soon as we have them. Speaking of We Come in Peace, it’s currently available for preorder. If you preorder, you’ll get a special limited-edition bonus core that you can’t get anywhere else. 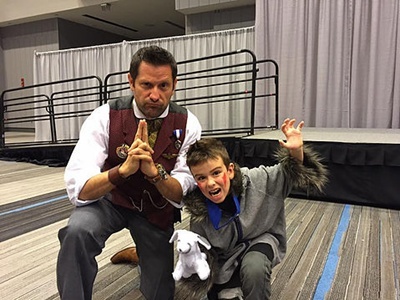 Grant sat as a judge for the Origins costume contest, along with two other TV alumni, voice actor Wayne Grayson (Yu-Gi-Oh!, Mutant Ninja Turtles) and director Darren Dunstan (Yu-Gi-Oh! 5Ds, Pokemon, Rick and Steve). From Princess Zelda to a space marine to samurai Avengers to a tiny Super Girl, the talented and the dedicated showed up in force and full regalia. Perhaps the highlight was Grant declaring his undying fandom for all Zelda games and telling everyone he was wearing Zelda socks. Emcee Tom Croom didn’t believe him, so Grant stood and hiked up his pant leg to show the world he is not only rather dashing, but a Zelda geek to the core. Yes, we had new T-shirts made—all the better for you to find us. Many of you asked if we had some for sale. We don’t, but don’t give up hope. There may be cool Rather Dashing merch—you know, other than our games—available in the future. Never give up hope. Never. Lastly, whether you can make it to a convention or not, we shout an enormous thank you to all of you for supporting Rather Dashing Games. You’re the best. We have so many ideas for great games, but you’re the ones who allow us to publish them. We’ll see you at Gen Con!